If you act fast, you can still catch the sakura in all (or at least most of) their glory. Cherry blossoms manage to beautify the soggiest of prospects. Many of the blossoms have fallen! You must visit the sakura without delay! The only thing almost as uplifting as the sight of all those blossoms in this cheerful red vehicle. WHEN: Friday, May 16, 11:30 a.m.
WHAT: Because the winter was so very long and brutal, sakura watchers say the High Park cherry trees are “much less dramatic and impactful” than they have been in previous years. But, also in part because the winter was so very long and brutal, we are grateful for all the beauty and bloom we can get—and we think these are pretty spectacular. 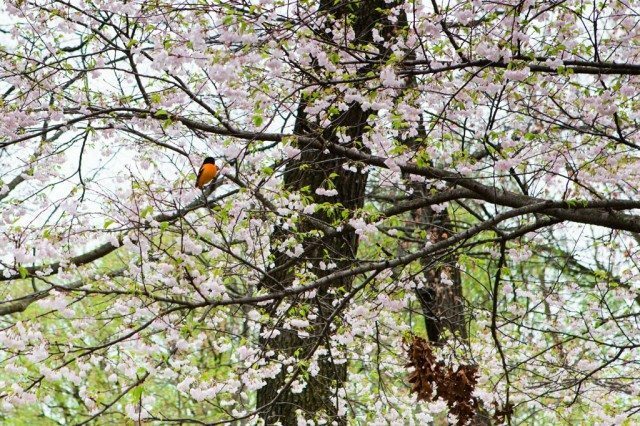 If you want to take in the spectacle up close, you should get yourself to High Park without delay: there’s a good chance the blossoms will last throughout the long weekend, but then again, it’s also possible that rain and wind will conspire to put an end to the season before Victoria Day arrives.